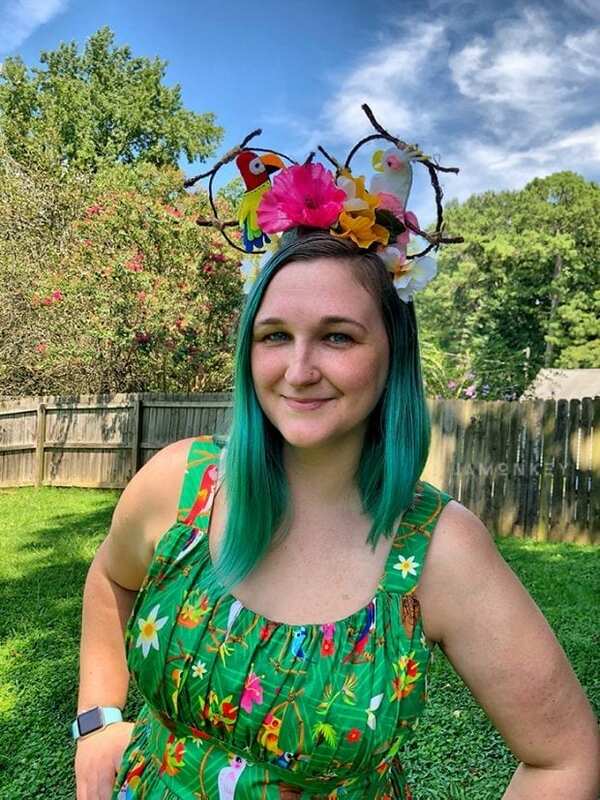 The Enchanted Tiki Room Sundress from The Dress Shop needs one more finishing touch, a pair of Enchanted Tiki Room Mickey ears! I made these adorable Mickey ears and they came out so great. 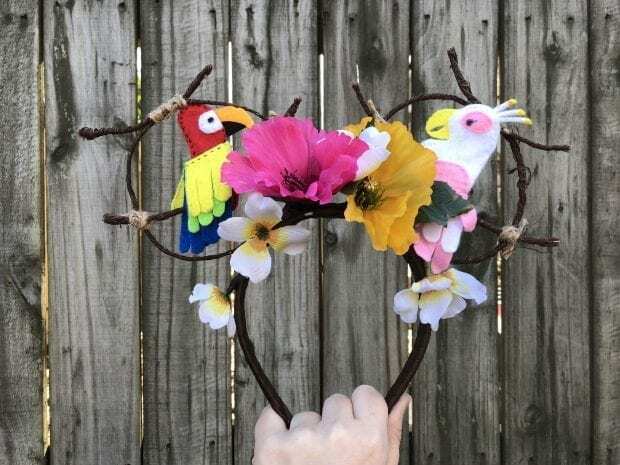 Here is how to make your own pair of Enchanted Tiki Room Mickey ears. The Walt Disney's Enchanted Tiki Room was the first attraction to feature audio-animatronics. The ears that I've created feature two different birds and they are perched on the within the ear like the perch in the attraction. Brown Rustic Wire – at least 18 gauge. Silk flowers – The Dollar Store is a great place to find cheap silk flowers. Brown ribbon – I used Grosgrain because the texture helps to keep the headband on your head. 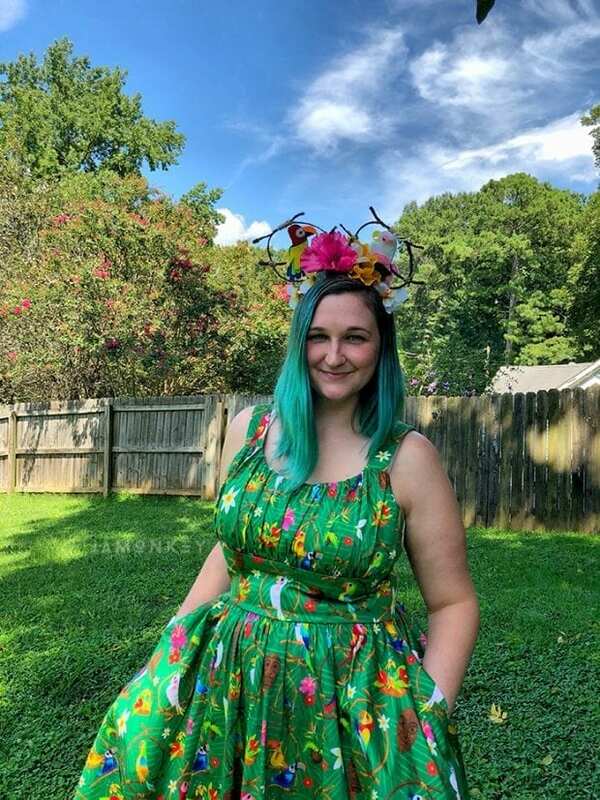 It also goes with the Tiki room look. The first thing I did was create the birds perch for the ear. You want to make a circle with the ear and have the ends cross at the top with a little excess. Glue at the top and then wrap in twine. Then you'll put the perch across the middle with a little excess on both ends. 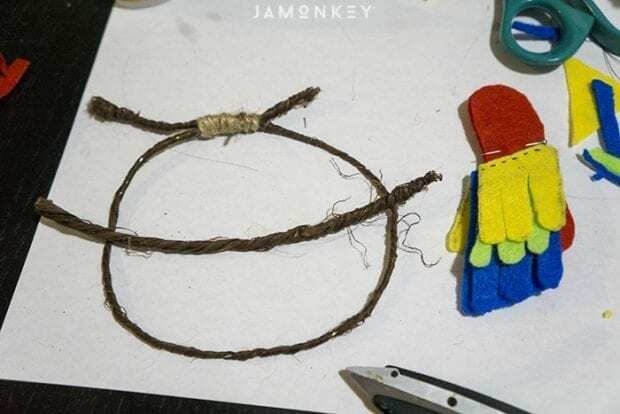 Glue and use twine to tie to the ear. The next thing I did was cut out a body and wings for the parrots. 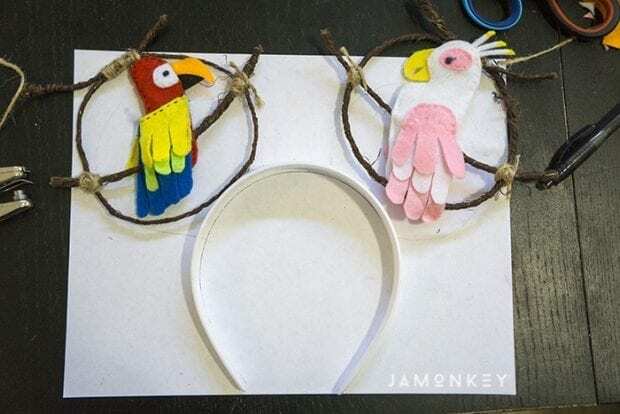 I made one look like Jose the multicolored macaw and the other to look like one of the female cockatoos. You want to cut two pieces of each felt so you can see the same bird from behind as well. For the wings, I made three layers and made each layer a little longer than the last so that you can just sew the one line across the body. The only piece you don't need double for is the beak. You can make one beak that will go between the two pieces. sew the bird together or use a strong fabric glue. Make sure to leave the bottom of the bird open to attach it to the perch. 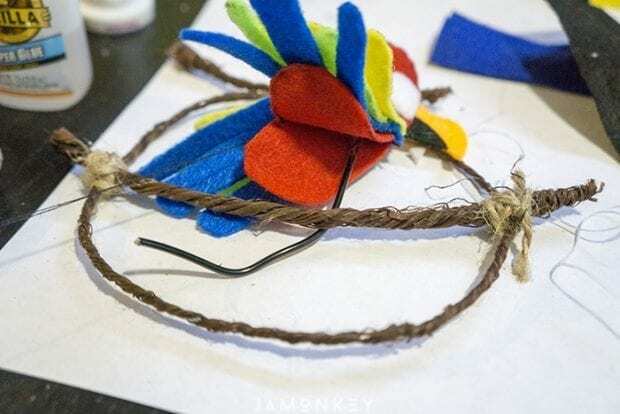 The bird needs to be reinforced, so use a piece of crafting wire inside the bird and wrap the bottom around the perch. Finish closing the bird up around the perch. Repeat with the second bird. The best way to secure the bird on the perch is to go through the middle of the bird. I reinforced the headband and the ears with a piece of crafting wire that went across the top of the headband. 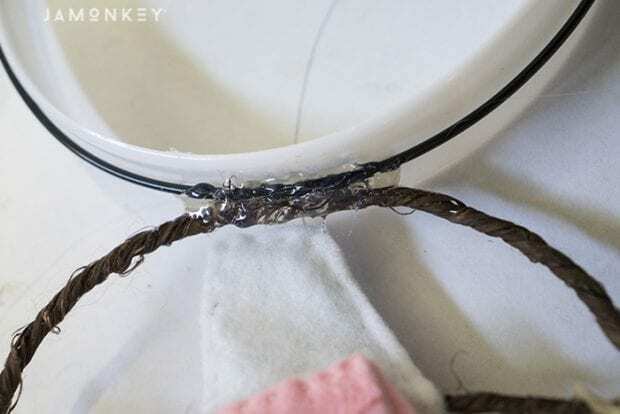 I then put a heaping amount of hot glue between the wire, ear, and headband. I then wrapped the same section with brown floral tape to make sure it was secure. The color doesn't really matter because you will be covering the area again with the brown ribbon. 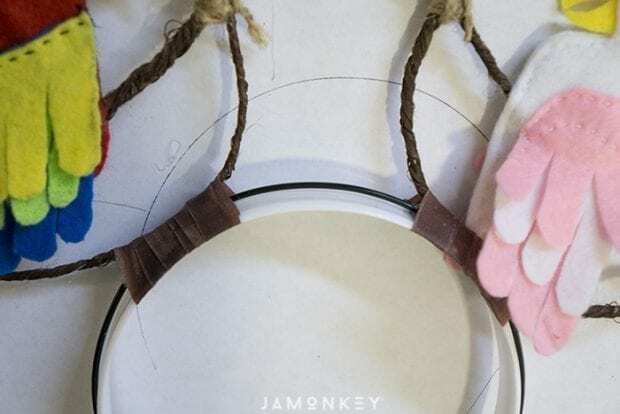 Using the silk flowers without their stems, place the flowers where you want on the headband with hot glue. You want to make sure you aren't covering up the bird. I put the bigger flowers in the middle to be more like the Minnie Mouse bow with a string of little flowers hanging down. Last, you'll tightly wrap, gluing as you go, the brown ribbon around the entire headband. While it is a more time-consuming set of ears, I love the way they turned out. It makes me feel like I've stepped right into the Enchanted Tiki Room!